The strategy here is straightforward, and everyone did just fine. What’s far more interesting is Allison’s Penultimate Wager. 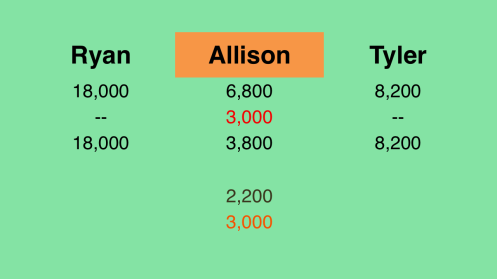 On the final clue of Double Jeopardy!, Allison received a Daily Double. She wagered 3,000, however, which looks bad on the outside, but, making certain assumptions, might actually be a better wager. Had she responded correctly, she would have entered a first equals second plus third situation. If she’s right in Final, she’ll either win or tie with a total of $19,600. If she’s wrong in Final, there’s a ~50% chance she’ll take the $2,000 second-place prize, because Tyler is also forced to wager everything. That’s an expected value (EV) of $10,650 if she gets the Daily Double right. Of course, again, this all depends on Ryan’s recognition of the situation – and maybe that’s not something on which you want to rely. What is the flight simulator?